Pick up a copy of the newspaper your local newsstand. Polar plunge is cold...but fun! The Hot RODs plungers led the way by being the first team to venture into the 42 degree water at Versailles State Park on Saturday. Despite the frigid water, they were all smiles. Indiana State Police Lt. Paul Adams of Versailles, a member of this year’s Hot RODs, carried the official Special Olympics Indiana torch. The full team consisted of: Megan Stamper, Alex Kieffer, Kendra Franklin, Benji Hyatt, Kevin Beiersdorfer, Jacob Eldridge, Maria Segrist, Emily Reece, Randy Schuman, Olivia Douglas, Amy Mitchell, Caz Burdette, Isaac Kramer, Todd Kramer, Yvonda Kramer, Jessica Heidorn, Madison Heidorn, Tim Paul, and LeAnn Lozier. 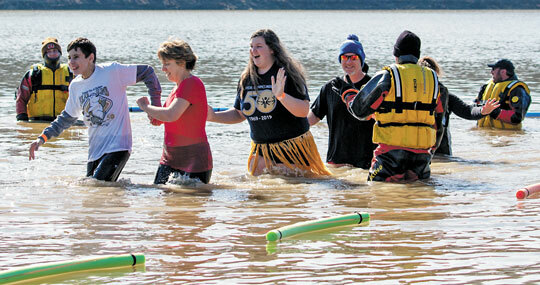 The Ripley-Ohio-Dearborn (ROD) chapter of Indiana Special Olympics held its annual Polar Plunge fundraising event on Saturday, February 16, at the Versailles State Park lake. Nearly 90 daring individuals “froze their fur off” by taking a lap through the lake’s frigid, 42(F) degree water to celebrate their goal of raising at least $75.00 for the local ROD chapter. For comparison on just how cold 42 degrees is, most people enjoy swimming pool water that is around 82-86 degrees. Competition swimming pools, which keep the water colder in order to facilitate vigorous physical activity, are still kept in the mid-to-high 70s. Acting as emcee for the day, WRBI Radio broadcaster Caz Burdette told the crowd, “Whether you are a veteran or first timer I promise this will be a day you won’t soon forget.” Burdette shared that Special Olympics chapters across the country are currently celebrating the organization’s 50th anniversary. Fundraisers like the Polar Plunge play a vital role in supporting Special Olympics athletes as they prepare for and perform in athletic competition. In addition to the big dip, community members also participated in the Polar Climb 5k run / 3k walk in the morning. Plungers and their fans also enjoyed several activities inside the official plunge tent, which included concessions, games, items for raffle and silent auction, and souvenirs. The Polar Plunge event wouldn’t be possible without the support of many local volunteers and organizations. In and around the water, the Dearborn County Water Rescue crew was on hand, as well as Rescue 69, Moores Hill Fire and EMS, Sparta EMS, the Ripley County Sheriff’s Department, and officers from Indiana’s Department of Natural Resources. Those public servants helped ensure a safe atmosphere for all involved. Approximately $44,000 was raised from the event.